The Church of Scientology welcomed its new Ideal Organization in the bustling metropolis of Tokyo, Japan on Saturday, August 8, before a captivated audience of more than a thousand. Japanese Scientologists and their guests gathered on Saturday, August 8, to celebrate the crowning of an exquisite Ideal Organization in Shinjuku City—the beating heart of Tokyo. Continuing an epic Scientology summer, the Tokyo Ideal Org opened its doors in Shinjuku City on Saturday, August 8. Scientologists from throughout Japan celebrated the grand occasion. Downtown Tokyo was the site of the traditional Japanese ribbon-cutting for Japan’ s first Ideal Organization on Saturday, August 8. The city of Tokyo played host to the grand opening of their very own Ideal Organization on Saturday, August 8. The ceremony marked the Church’s latest ambitious breakthrough during a period of unprecedented innovation and revolutionary growth. 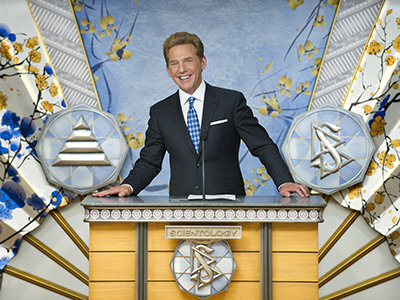 Mr. Miscavige traveled to Japan to officiate the dedication ceremony. He was joined by more than a thousand Scientologists for the historic occasion. Mr. David Miscavige, Chairman of the Board Religious Technology Center and ecclesiastical leader of the Scientology religion, with (left to right): Mr. Takayuki Shirota, Director of the Japanese Learning Support Institute; Mr. Tomoo Furubo, Member of the Toshima City Assembly in Tokyo; Mr. Masami Saito, Member of Parliament for Miyagi Prefecture; and Mr. Tomoki Hirabayashi, General Secretary of the national nonprofit Challenge Again of Tokyo. The new Ideal Org of Tokyo stands in Shinjuku City, just minutes away from the world’s largest train station and Shibuya, Tokyo’s Times Square. The modern eight-story structure stands as a beacon of spirituality for the greater than 5 million people who flock daily through the surrounding district, not to mention the millions more who call the mega-metropolis home. Church of Scientology Ideal Org of Tokyo. The Scientology Ideal Organization of Tokyo welcomes anyone wishing to obtain an introduction to Dianetics and Scientology. The Public Information Center presents more than 500 films, providing a complete introduction to every aspect of Dianetics and Scientology—including the beliefs and practices of the religion and an array of Church-sponsored humanitarian and social betterment programs. Visitors are welcome to take a self-guided tour of the Center’s displays at their leisure and to return as often as they like. The first floor Café welcomes all visitors touring the Church. The Ideal Organization of Tokyo features course rooms designated for introductory services including an array of Scientology Life Improvement Courses, each one designed to improve any aspect of one’s life. Among the many introductory services available are evening and weekend seminars on the fundamental principles of Dianetics and Scientology and their application in everyday living. The Bookstore makes available L. Ron Hubbard’s works on Dianetics and Scientology. In total, Mr. Hubbard’s legacy spans tens of millions of published words in dozens of books and thousands of recorded lectures. Materials are available in 50 languages. Scientology Founder L. Ron Hubbard developed the Purification Program to free individuals from the mental and spiritual damage caused by drugs and toxins as well as exposure to radiation. It consists of a regimen of exercise, sauna and nutrition—all of which are available in the Purification Center. In the Hubbard Guidance Center, Scientologists participate in auditing (spiritual counseling). Beyond this waiting area are rows of auditing rooms to meet the needs of Tokyo’s expanding congregation. Scientology auditing (spiritual counseling) is delivered in an array of auditing rooms, each of which provides a quiet, distraction-free environment necessary to achieve spiritual enlightenment. In the Academy, Scientologists train to become auditors (spiritual counselors) capable of applying the technology of auditing to help others attain spiritual freedom. The Tokyo Academy comprises multiple course rooms, each devoted to a different aspect of training. Scientology services and ceremonies are convened in the Chapel, including Sunday services open to members of all denominations. The Chapel further serves as an ideal venue for civic occasions, including receptions and formal banquets in the name of community partnerships across all 23 cities of the Tokyo metropolis. The Skyline Café on the top floor provides a gathering place for those attending our many scheduled events. It further provides for parishioners during breaks in their Scientology services. The rooftop terrace, overlooking Shinjuku, serves as a meeting ground and a home to both Scientologists and the greater community alike. As is traditional in all Churches of Scientology, the Office of L. Ron Hubbard stands in honor of the religion’s Founder and symbolizes that this Church is true to his writings and ideals. Glorious new era lifts off in Land of the Rising Sun with auspicious ribbon-cutting on majestic new spiritual center for a religion in the midst of game-changing expansion. Adding yet another shining beacon of hope and freedom in a year of extraordinary achievement, the Church of Scientology welcomed its new Ideal Organization in the bustling metropolis of Tokyo, Japan, on Saturday, August 8, before a captivated audience of more than a thousand—the Church’s latest ambitious breakthrough during a period of unprecedented innovation and revolutionary growth. This new Ideal Org stands in Shinjuku City, just minutes away from the world’s largest train station and Shibuya, Tokyo’s Times Square. The modern eight-story structure stands as a beacon of spirituality for the greater than 5 million people who flock daily through the surrounding district, not to mention the millions more who call Tokyo home. In recognition of Tokyo’s long dedication to working with Church-sponsored humanitarian programs and its legacy, and in honor of the historic impact of Scientology in the Asian nation, dignitaries from up and down the islands were on hand to personally welcome the Ideal Org’s celebrated launch. Joining the Scientology parishioners and Church officials were Mr. Masami Saito, Member of Parliament for Miyagi Prefecture; Mr. Tomoo Furubo, Member of the Toshima City Assembly in Tokyo; Mr. Takayuki Shirota, Director of the Learning Support Institute; and Mr. Tomoki Hirabayashi, General Secretary of the national nonprofit Challenge Again Tokyo. In highlighting Scientologists’ extraordinary efforts to combat drug abuse, Mr. Furubo recalled how in 2012, quasi-legal narcotics known as “legal herbs” were spiraling out of control in Japan, leading to overdoses, violence and death. Tokyo’s new Ideal Organization presents all visitors with an introduction to Dianetics and Scientology, beginning with the Public Information Center. Its displays, containing more than 500 films, present the beliefs and practices of the Scientology religion and the life and legacy of Mr. Hubbard. The Information Center also offers a detailed overview of the many Church-sponsored humanitarian programs. These include a worldwide human rights education initiative; a far-reaching drug education, prevention and rehabilitation program; a global network of literacy and learning centers; and the Scientology Volunteer Ministers program, held in the highest regard by the thousands of Japanese who received its help after the 2011 tsunami and now representing the world’s largest independent relief force. The Ideal Org of Tokyo also features a Chapel for Scientology congregational gatherings, including Sunday services, weddings and naming ceremonies as well as a host of community-wide events open to members of all denominations. The Ideal Org further includes multiple seminar rooms and classrooms, in addition to an entire floor dedicated to Scientology auditing (spiritual counseling). The Church of Scientology has enjoyed greater expansion during the past decade than in the previous 50 years combined. The first half of 2015 bears this out, marked by historic achievements and monumental openings for the religion. These include the July 18 grand opening of the new Ideal Continental Liaison Office in East Grinstead, United Kingdom; the July 11 opening of the Scientology Information Center at the Church's spiritual headquarters in Clearwater, Florida—along with six new centers to make Church-supported humanitarian programs readily available to the Clearwater community; the dedication of the majestic Ideal Church of Scientology in Bogotá, Colombia, on July 5; and the opening in April of another Ideal Church of Scientology where France, Germany and Switzerland converge: in Basel, Switzerland. The Church now operates more than 40 Ideal Organizations across six continents. More openings are planned in cultural epicenters in Australia, Africa, Europe and North America in the year ahead.